Take your old book and tear out 2 or 3 pages. Cut them down into 2-3 portions per page. Fold them down the middle. Tear the edges off to make a nice rustic look. This will make a small little mini book. Roll some red Premo! clay through the pasta machine on the 2nd largest setting. Take an acrylic roller and make a gentle imprint of the pages to follow when cutting your template. Cut out the left, top, and bottom edges using a blade. Your should be able to see an approximate “line” where the right page edge lays. 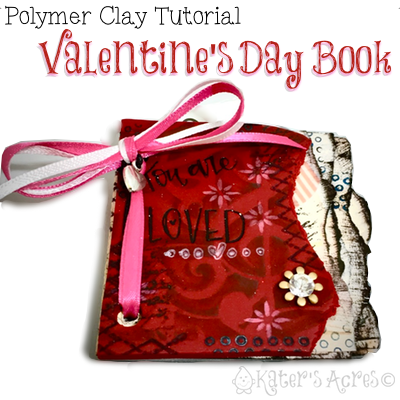 Like you did with the pages, TEAR your clay to make a nice rustic edge. This will be your FRONT cover. Repeat these same steps for the BACK of the book, except do NOT tear the right edge, also cut it to size using your blade. Add any embellishments or fun designs you would like onto your front cover. I made my front cover using my Faux Collage Veneers Technique tutorial. Once your front plate is decorated, use your 1/4″ cutter and cut a hole 1/4″ down and 1/4″ in from the top edge. Repeat by cutting 1/4″ up and 1/4″ in from the bottom edge. Repeat cutting these holes onto the back plate of your book. Place both the front & back plates of your book onto ceramic tiles. While your font & back plates are baking, decorate your inside book pages. Using a thin layer of white gesso (I like the page text to show through a little) lightly cover the page with a brush on both front and back. Let dry. Add random stamped images onto the pages. Use an ink pad to add “shading” onto the edges of the pages to give an old, worn, antique look. Refold your pages and assemble as one signature. Use a black gelly roll pen to write whatever message you would like on the page. I chose the theme of my book to be why I love you. By this time your book plates should be done baking and mostly cooled. Gather your ribbons and charms. Punch holes into your book signature. Thread ribbons through your Valentine’s Day book. Previous post: Fingerprints in Polymer Clay: Two Tips to Banish Them!